Tribeca Review: "The Bang Bang Club"
“The Bang Bang Club” was a group of four photographers who covered the civil unrest that spilled blood across the townships of South Africa during the last years of Apartheid, from 1990 to 1994, killing more than 20,000. Two of those men, Greg Marinovich and Joao Silva, would go onto write a book about their exploits, and now writer-director Steven Silver has adapted the film for the big screen, starring Taylor Kitcsch, Ryan Phillippe and Malin Ackerman. Silver spreads himself a little thin, trying to give each of his photogs some measure of a backstory. 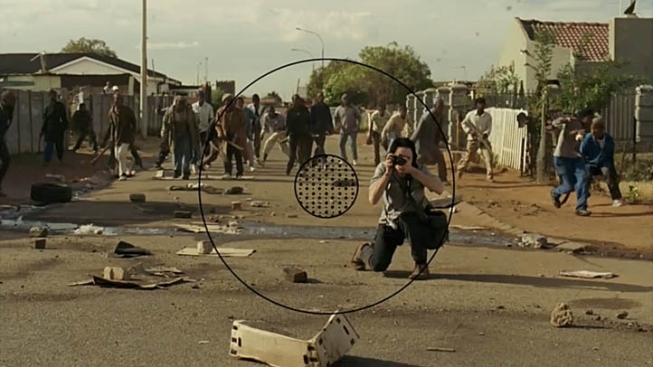 But instead of giving us a fuller picture of the stresses of the job, it distracts from the action on the streets of South Africa, where the film truly excels, in its often brutal portrayal of sniper fire, immolation and machete swinging. To his credit, Silver doesn’t choose sides in the bloody battle between Nelson Mandela’s African National Congress and the Inkatha Freedom Party, but still makes it clear that there were murderous, unprovoked assaults on both sides. The clashes in the streets are tense and crackling, with all sorts of “bang-bang” ringing through the air. But where Silver fails his film and his subject is in offering only a limp defense of four white guys standing around taking pictures of black people slaughtering each other in the streets. The fact is these guys went where few would dare, informing the world about what was really happening, and in turn giving those involved the moral courage to stop it. The fellow journalists who challenge Carter for not intervening are literally nameless, while the one person who challenges the “Club” is such a bitter, 2-dimensional character; it’s hard to take his complaints seriously. Taylor Kitsch doesn’t give a star-making turn in “The Bang Bang Club,” it’s too small a role in too small a film, but he does manage to prove that he’s got movie star chops. If you saw Kitsch during his time on “Friday Night Lights,” you know he can do the brooding/smoldering thing, but here he’s wide-eyed and buoyant. And, more surprisingly, pulls off the most credible South African accent of all the Americans in the film. He gets saddled with some of the film’s sappier moments, but that’s hardly his fault. There are gripping scenes of violence and the story is remarkable, but “The Bang Bang Club” is ultimately uneven and fails to exhibit the courage of its central figures’ convictions. “The Bang Bang Club” is showing as part of the Tribeca Film Festival on Thursday, April 21, at 6 pm at the Borough of Manhattan Community College. It goes into limited release on Friday, April 22.